When the summer heat and humidity becomes unbearable, jumping in a pool, playing in the ocean or cooling off at the lake is a must. The cold water provides a break from the heat and a fun time for the whole family. However, fun can turn into disaster if parents and children don’t know the ins and outs of water safety. According to the CDC, an average of 10 people die in the U.S. from accidental drowning every day and 20% of them are 14 or younger. To ensure the time you and your family spend in the water is nothing but safe and fun, the American Red Cross has launched a free Swim App, designed to help your family stay safe in any type of aquatic setting. Available directly from the Apple App Store, Google Play or Amazon Marketplace, the swim app teaches both parent and child the importance of water safety. The swim app provides quizzes for parents to take on water safety in different settings, such as lakes, rivers, beaches and pools. The safety section of the app addresses water safety issues such as prevention, emergencies, where drownings occur and the importance of life jackets. The app also provides a progress section for children enrolled in swimming lessons. Learning how to swim is not always fun. It can be scary and intense, and much harder for some than others. 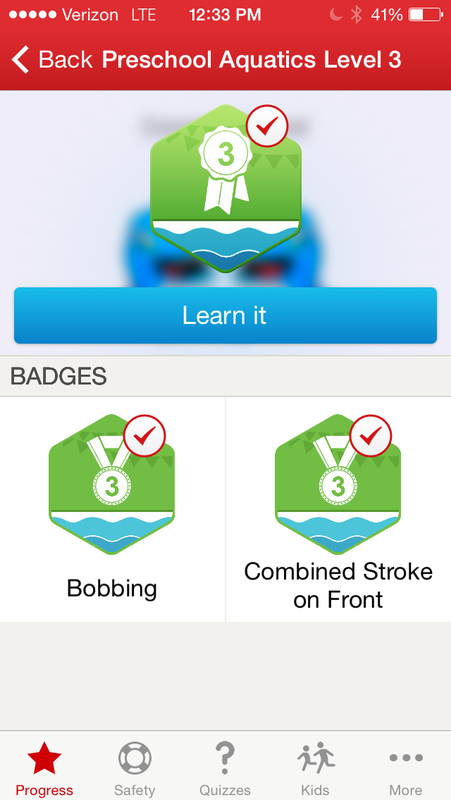 The progress section of the app rewards children with a badge each time they complete a swimming level. Earning a badge encourages children to complete the next swimming level and lets parents share their child’s progress with family members and friends. The section also includes information for parents on each swimming level so you know exactly what your child has learned. It includes a skill check-list, as well as a “find a class” option. The apps kid section consists of five fun lessons, including water safety in your home and helping someone in the water. Each lesson has a kid-friendly video as well as a “learn about the rule” section. After watching the video and learning about the rule, kids can take a quiz to show that they understand the lesson. They may just learn something that could save a life! Drowning can happen in less than one minute and is the second-leading cause of accidental injury death for kids and sixth for people of all ages. With the swim app, parents gain knowledge that will keep them and their kids safe, and kids are able to learn, in their own way, the importance of knowing how to swim and water safety. The American Red Cross has helped reduce accidental drownings by almost 90% nationwide in the last century. Earlier this year, the American Red Cross launched the drowning prevention campaign. A national campaign aimed at reducing the drowning rate in 50 cities by 50 percent over the next five years. The American Red Cross is the gold standard for aquatics training and offers a variety of swim course’s, such as the learn-to-swim course, parent and child aquatics and preschool aquatics.